What is Kind Canada Généreux? 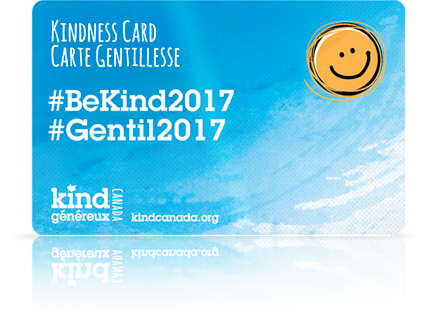 Kind Canada Généreux aims to be the national champion for the advancement of kindness in Canada, focusing on the power and science of kindness. Kind Canada Généreux is a not-for-profit, non-government organization with no religious or political affiliation. 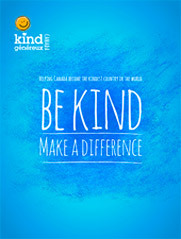 Kind Canada Généreux promotes and encourages all Canadians to purposefully include kindness in their daily lives, support charitable causes and enhance the well-being of others. What is the science of kindness? Kindness stimulates the production of Serotonin, which heals our wounds, calms us, and makes us happy. 8 out of 10 patients in Mental Health Centres are serotonin deficient. Kindness boosts serotonin in the giver, the receiver and the observer so when we embrace kindness we spread it. Kindness also boosts endorphins – the brain’s natural painkiller, Endorphins are 3 times more effective than morphine. Kindness is also related to the release of oxytocin, which promotes social bonding, calming, trust and generosity, strengthens the immune system and boosts virility. Compassionate people have twice the amount of DHEA, which slows down aging and 23% less of the stress hormone cortisol. What are the Positive Side-Effects of Kindness?